22″ x 30″ on an old piece of art board… it has no frame or hanger, it would be up to you to handle display arrangements. it is possible that if you frame it then it could appear slightly crooked or wonky due to how i painted it but if you live on a houseboat or yacht or if you often imbibe strong spirits or use the ganga , you are probably used to that feeling. but it could look straight if the framer person has a real talent. 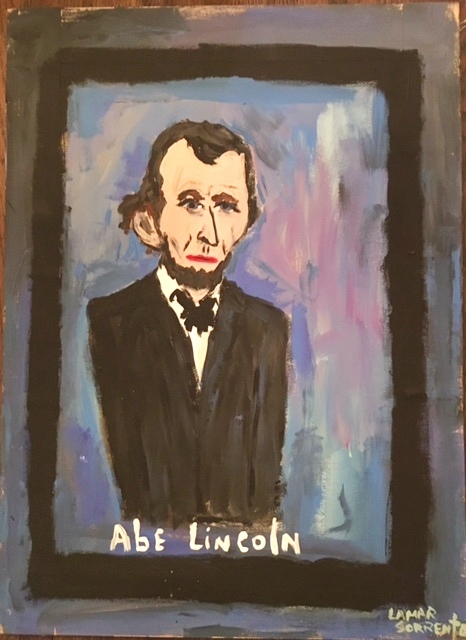 i am still just starting my sabbatical….. when i painted Abe i thought it was a good one, but i just found this in the fireplace, its been there for a season or two, blocking air…..and i thought, oh well, maybe someone would want this. the colors are sort of morbid, so if you have a bright cheery room perhaps this could add a nice balance.